Razer is stretching again. 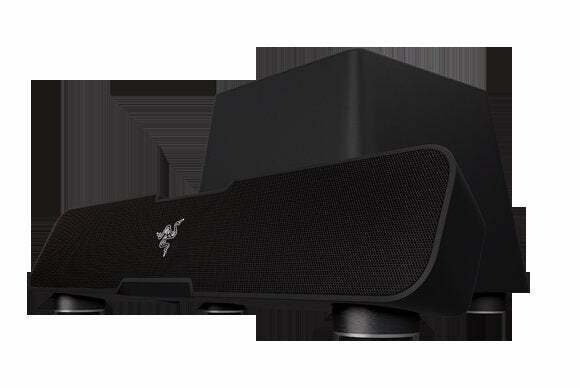 The company best known for designing and manufacturing cutting-edge gaming notebooks and peripherals will soon offer a soundbar-and-subwoofer combo. 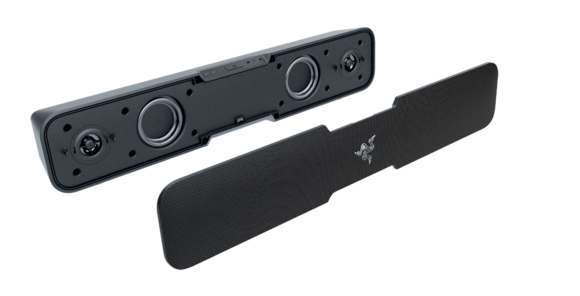 The $199 Razer Leviathan boasts an impressive collection of features, including the ability to decode Dolby Digital and aptX Bluetooth bit streams. Razer has produced speakers in its past, but a gaming headset was the only audio product in its current lineup prior to this announcement. I don’t usually think of sound bars as gaming speakers, but who am I to argue with Razer’s marketing plans? The press release indicates that the sound bar half of the setup can fit beneath a desktop monitor or in a living-room entertainment center. A company spokesperson responded to my request for dimensions after the story was published. The sound bar cabinet is just 2.83 inches tall, so it should indeed sit in front of or even beneath the typical desktop monitor or TV. The sound bar cabinet can be tilted 0-, 15-, or 18-degree angles to direct the sound where you want. Three EQ presets optimize sound for gaming, movies, or music. The speaker is outfitted with the appropriate inputs for playing games, watching movies, or listening to music from a variety of sources, including smartphones. You can connect a digital audio source via an optical cable or by pairing a Bluetooth device (NFC is supported for easier pairing), or an analog stereo source via a copper cable. A 15-watt-per-channel amplifier drives two 2.5-inch full-range drivers and two 0.74-inch tweeters. Razer claims frequency response rate from 180Hz to 20kHz for the sound bar. A third 30-watt amplifier channel drives the 5.25-inch full-range driver in the subwoofer, which delivers frequency response rate of 20- to 180Hz. The Leviathan is available for preorder now, with worldwide availability sometime in November. Update: This story was updated with new information regarding the speaker cabinet's dimensions and the amplifier that we received after the story was originally published.